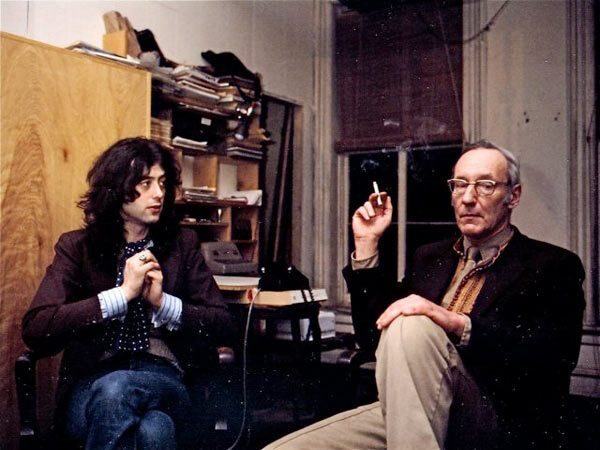 Rock Magic: Jimmy Page, Led Zeppelin, And a search for the elusive Stairway to Heaven by William Burroughs, Crawdaddy Magazine, June 1975. When I was first asked to write an article on the Led Zeppelin group, to be based on attending a concert and talking with Jimmy Page, I was not sure I could do it, not being sufficiently knowledgeable about music to attempt anything in the way of musical criticism or even evaluation. I decided simply to attend the concert and talk with Jimmy Page and let the article develop. If you consider any set of data without a preconceived viewpoint, then a viewpoint will emerge from the data. So there we sat, I decline earplugs; I am used to loud drum and horn music from Morocco, and it always has, if skillfully performed, an exhilarating and energizing effect on me. As the performance got underway I experienced this musical exhilaration, which was all the more pleasant for being easily controlled, and I knew then that nothing bad was going to happen. This was a safe and friendly area–but at the same time highly charged. There was a palpable interchange of energy between the performers and the audience which was never frantic or jagged. The special effects were handled well and not overdone. A few special effects are much better than too many. I can see the laser beams cutting dry ice smoke, which drew an appreciative cheer from the audience. Jimmy Page’s number with the broken guitar strings came across with a real impact, as did John Bonham’s drum solo and the lyrics delivered with unfailing vitality by Robert Plant. The performers were doing their best, and it was very good. The last number, “Stairway to Heaven”, where the audience lit matches and there was a scattering of sparklers here and there, found the audience well-behaved and joyous, creating the atmosphere of a high school Christmas play. All in all a good show; neither low nor insipid. Leaving the concert hall was like getting off a jet plane. I summarized my impressions after the concert in a few notes to serve as a basis for my talk with Jimmy Page. “The essential ingredient for any successful rock group is energy–the ability to give out energy, to receive energy from the audience and to give it back to the audience. A rock concert is in fact a rite involving the evocation and transmutation of energy. Rock stars may be compared to priests, a theme that was treated in Peter Watkins’ film ‘Privilege’. In that film a rock star was manipulated by reactionary forces to set up a state religion; this scenario seems unlikely, I think a rock group singing political slogans would leave its audience at the door.